Leave the choice of style and colours to us to pick the best blooms of the day or if you have your favourites pick the style and/or colur and put a message in "Any Requests" with variety of flowers you like/don't like. Want Anything extra with your order? A Teddy Bear, Balloon, or another floral gift can be added to your shopping cart with no extra delivery charge. Have you checked out our other gift pages? The photo of the flower, planted gift displayed provides an accurate guide to the quality, type and colour of the flowers supplied. We will do our best to oblige any requests for particular flowers, 'loves lilies', 'no lillies', AM or PM deliveries, 'leave flowers with No. 6' etc. A message box is avalable on the next web page, pick-up the phone or drop us an email. Our opening Hours are: Monday-Friday 9am-5:30pm; Saturday 9am-5pm; Closed Sunday. The standard same day (orders need to be placed by 2pm)/ future date flower delivery charge is £5.00, free collection (naturally!) 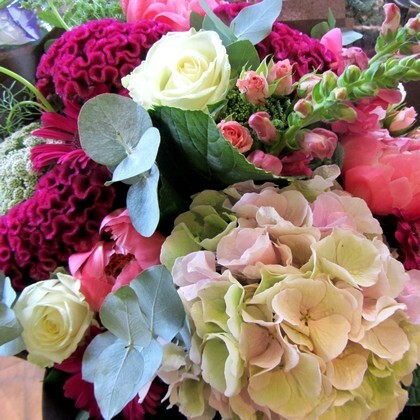 and we now offer a premium 3-hour guaranteed flower delivery service for £10 from our Bushey shop. If you have a query with our delivery areas, or regarding an order please phone, during shop hours, 020 8950 3384 or email .